After Joan Cook had been installed as President, she led worship to close the General Assembly Meetings. We are pleased to print her address in this issue of Waymark. We have come to the end of our meetings, we have argued, agreed; discussed, debated; eaten, elected; criticised and connected. So now with our depleted energy levels we prepare to leave, to return to our homes, our families, our daily lives and congregations. But these meetings will not have served their purpose if you aren’t just a little more informed, stimulated, encouraged, inspired, and energised! It is difficult following on from a meeting, or conference, to maintain the levels of energy and commitment which are built up, during time spent with others in pursuance of a shared activity or aim, but that can be overcome. One sure way to ensure a replenishing of spiritual energy is by action. Just as we often feel more energised after a walk, or a swim, our spiritual energy can be re-invigorated by action. And didn’t we all just feel a little more energised after the Buyan Opening Ceremony? Evidenced by the number of people jigging their way to the bar! But what do we mean by spiritual energy? Well for a start, I don’t mean the type of energy that enables one to complete a marathon, climb a Munro, or sail single handed across the Atlantic. What I mean is the type of energy which spurs us on to follow through on our ministries, to live our lives according to our Unitarian values, our spiritual energy. The energy we create, and benefit from, by being part of encouraging, spiritual communities. If we leave this place, and pack up all the interesting discussions, meetings, and workshops into our suitcases, along with the dirty washing and well-thumbed copies of the annual report, we will feel drained. We will feel that have nothing more to offer; but tomorrow, many of us will be back in front of congregations who have no notion of what has gone on here, and may well be thinking their delegates have had a jolly at the expense of the church’s bank account, then not only will we lose out, but our congregations will lose the opportunity to benefit from our time here. Those of us who have been fortunate enough to have spent the past few days in such inspiring company, whether or not delegates, have a duty to take our experiences back to our communities, to share that information and inspiration with others. And in order that we can pass on some at least, of the inspiration, learning, and sense of connectivity that we have found here, we need to be able to draw on resources within us. Our spiritual energy. So, at the end of some long days, where can we find this energy. How can we become energised? Well, we can find sources for such energy from various sources around us. From the music which we have heard; in our various comings together in social groups and events; as well as in our times of worship. We heard about energy and communities from Matt Carmichael in the John Relly Beard lecture on Wednesday, and the importance of inter-personal connections. The hymns we have sung, the words we have heard, all these energise us, helping us find resources which we thought were depleted. From our environment; the sights and sounds of the natural world, the signs of re-growth we are starting to see around us, fortunate as we have been to have spent the past few days, and for some even longer, surrounded by these beautiful open spaces. Many of us find the physical environment provides an energising force, in many ways, not only physical. There are those who see the divine in every ‘root, stone and tree’. These all stimulate the energy within us, the energy which is our connection with each other, our world, and the divine. But perhaps the greatest of these is the connecting and connections we have made with each other. In our coming together, in communion, we energise ourselves and others, we create energy! What we gain from our time with one another, as we meet together, talk, worship, share ideas, meals, and experiences, is what contributes most to the growth and development of the spiritual energy that is within us. Much has been written about the advantages of being part of a group, human beings are after all social animals, and psychologists have proved time and again, how being part of a group leads to improved physical and psychological health, as well as enabling us to make better decisions. Being with others where we can express ourselves, and discuss issues of importance to us, also helps us to develop a deeper understanding of our own personal spirituality. I can’t remember where I first came across this story, it is about a minister on one of the islands, off the west coast of Scotland. Every Sunday the minister would lead his flock in worship, but one Sunday he noticed Tam was absent, thinking he may be unwell, the minister walked across the island to Tam’s croft, where he found him sitting quietly and alone by the fire. He asked him if he was well, and hearing he was, the minister sat down opposite Tam. After a while of sitting together in silence, the minister picked up the fire-tongs, reached into the fire, pulling out a burning coal, and set it alone on the hearth. Once more the two sat in silence. The glow from the coal, grew less and less, it ceased to burn, and eventually darkened. At which point the minister picked up the coal, and dropped it back into the glowing fire, where it once again began to flame. Nodding to Tam, who returned the nod, the minister left, and made his way back across the island to the manse. The following Sunday, Tam was back in his usual pew, joining in the service with his fellow islanders. This story illustrates the need we have for each other, to be part of something. How being with others kindles their spark, just as they kindle ours. We often hear the argument that you don’t actually need to go to church to be a Unitarian, well, no, you don’t. 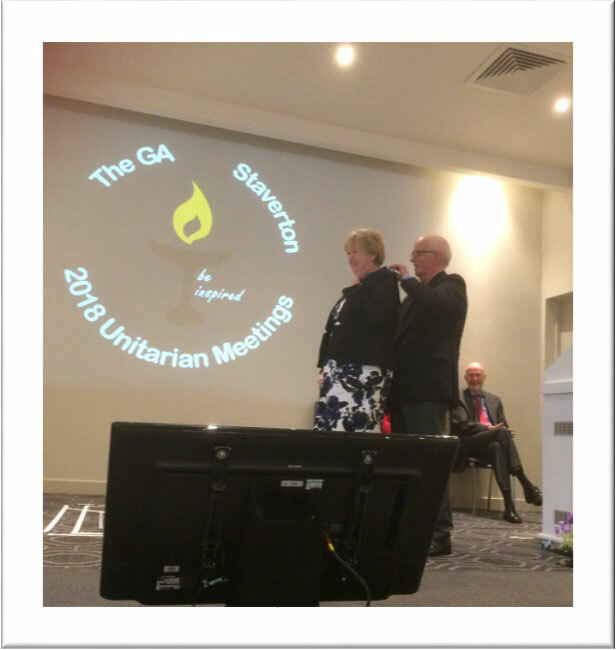 There are plenty Unitarians who live far from Unitarian congregations, but it is by being with others, of like mind, sharing the same ethos, and principles that we find our own personal faith becomes stronger, glows more brightly, and that we don’t lose our glow, darken and die. And it is our personal faith that enables us to live our Unitarian lives. These lines are from the statement of Mutual Commitment to Ministry, compiled by members of St Mark’s, and our previous minister, Rev Maud Robinson. And to receive the gifts of others. So, as we leave here today, may we be inspired to ‘deepen and develop our liberal and progressive faith’* by our living energy!